When distinguished professor Saul Tzipori was recruited in 1991 to teach microbiology, there was no research staff or infrastructure on the Grafton campus for studying infectious diseases. “I was truly starting from scratch,” he recalled. “I had a part-time technician and not a single test tube.”But within eighteen months, Tzipori secured funding from NIH and USAID and started building an infectious-disease division. With investigators qualified to teach basic science—microbiology, parasitology, molecular biology, and immunology—the school could move students to Grafton. Tzipori, the Agnes Varis University Chair in Science and Society, chairs the 67-member Department of Infectious Disease and Global Health, which now occupies two laboratory buildings and the New England Regional Biosafety Laboratory, and has attracted some $150 million in research funding to date. Here are some of the globe’s most serious health threats that Cummings School’s scientists study. An estimated 840,000 children under age 5 die from diarrheal disease every year—more than from measles, malaria, and AIDS combined. 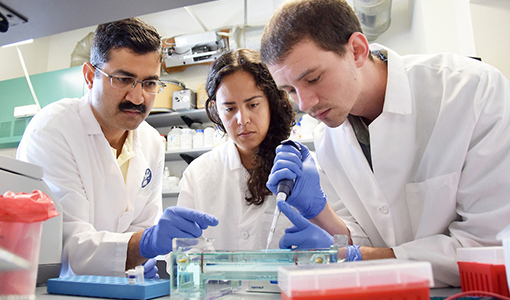 With support from the NIH, Tzipori and his colleagues, including assistant professor Abhineet Sheoran, are working to develop a vaccine for the cryptosporidium parasite using the research lines from his lab—the only one in the world that maintains the species most dangerous to humans. Meanwhile, the Bill & Melinda Gates Foundation is supporting the lab’s research, and Giovanni Widmer is studying microbial populations in the gut for clues about why some children can weather crypto infections. Professor Charles B. Shoemaker researches more effective, less expensive ways to combat botulism, a bioterrorism threat to service-members and others. In 2010, he used antibodies in alpaca blood to develop a new antitoxin and later demonstrated that gene therapy could deliver the antitoxin (and confer vaccine-like protection). The work could lead to treatments for other diseases caused by bacteria, including those related to E. coli food poisoning, and the hospital-acquired superbug Clostridium difficile. More than 200,000 people die from so-called snail fever each year around the world—a death toll second only to malaria—and even in survivors the infection can lead to such problems as stunted growth and reduced fertility. A lack of clean drinking water and adequate sanitation creates ideal conditions for the parasite, which is carried by freshwater snails. In order to better treat, or even prevent, the infection, professor Patrick J. Skelly and research associate professor Akram Da’darah are working to reveal how schistosome worms slip by the body’s defense system. If it’s causing alarming headlines, there’s a good chance professor Sam Telford is working on it. In addition to fighting Lyme disease by immunizing wild mice, Telford and Tufts colleagues also reported the first U.S. case of human B. miyamotoi infection, and plan to test genetic variants of Powassan virus to learn what’s driving an uptick in the rare but dangerous illness. Professor Jonathan Runstadler and his team are on a mission to help protect the world from constantly evolving strains of influenza. They head out into the field to collect thousands of samples from birds and other animals. One day they hope to help develop a universal vaccine, as well as uncover what factors increase the flu’s pandemic potential. Once largely under control, this bacterial respiratory illness has come raging back, with as many as 1.7 million deaths each year. However, not everyone infected develops active disease, and assistant professor Gillian Beamer is trying to figure out why. The answer could inform a more effective vaccine, new antibiotics, and less-invasive diagnostics. A conservation medicine alum addresses the problem of free-ranging dogs on the Tibetan plateau. After she had trouble finding care for her own dairy goats, Cara Sammons-Shepard, V16, decided to become a traveling veterinarian herself. Over 40 years, Cummings School has become an international leader in veterinary medicine. And all it took was buying nearly 600 acres for a dollar, palpating police horses, and performing the occasional surgery by penlight.